We make literally TONS of residential & commercial foam trim. We can cut ANY custom shape easily. We can manufacture large quantities in a short amount of time. We have a 60,000 square foot facility and over 30 years experience. Johnson County Foam is a production powerhouse for foam trim. Tell us what you need and we will make it for you. 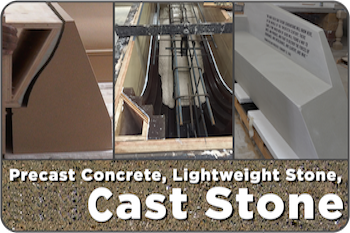 We design & manufacture molds for precast stone, precast concrete, lightweight stone, fiberglass, rubber, and much more. We also have a department that mass produces all these products once the molds are made. We can make any size, shape, or profile. Not only do we make all standard items, but also ANYTHING custom you can imagine. 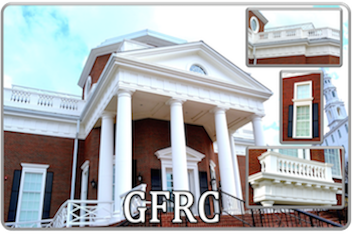 GFRC can be used to create durable and exquisitely detailed ornamental concrete. It can be used to create durable and exquisitely detailed ornamental concrete. Johnson County Foam has decades of experience with how to use Glass Fiber Reinforced Concrete to its full potential. We have a variety of ways to take your project from concept to completion. 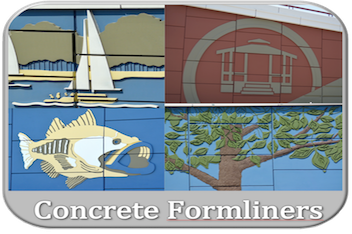 We can create and manufacture custom concrete formliners for your next project. We make rubber molds that can be used over and over. Any size, any shape, any texture. It is one of our specialties. Here at JCF we have a large arsenal of tools that make even your most complex projects seem simple. 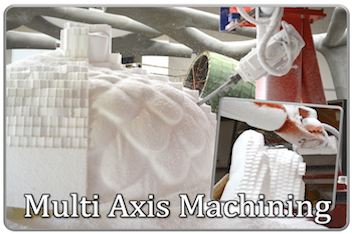 We have two 5 axis machines and a 3 axis water jet. We can make any size statue, stage prop, or sculpture. We are fast, efficient, and affordable. We machine them, plastic coat them, and get them ready for either end use or a mold so they can be mass produced. Our equipment is all computer guided and very precise. Our 3 axis water jet has 65,000 psi of pressure, but is incredibly precise as you can see. It can cut any design out of rubber, paper, wood, plastic, fiberglass, or metal up to 2″ thick! This allows us a lot of versatility in the services we can provide for your more demanding customers. It is an ideal method for cutting machine parts that are sensitive to high temperatures. We can digitally scan any object in 3D to a very precise model. We can then scale the object to any size. We can 3D print it for you or cut it out of foam. We can then plastic coat it and paint it or make a mold for mass production out of virtually any material you need. The possibilities are truly endless. We love doing creative projects! 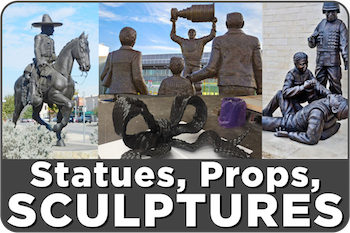 We can make any size statue, stage prop, or sculpture. We are fast, efficient, and affordable. We machine them, plastic coat them, and get them ready for either end use or a mold so they can be mass produced. Our equipment is all computer guided and very precise. We started Johnson County Foam 30 years in our backyard in a little building we called the bunkhouse. We are now a 60,000 square foot production powerhouse. 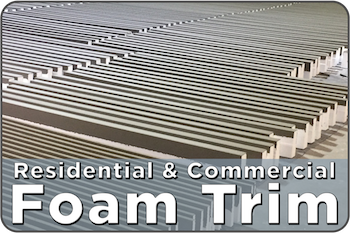 We make literally TONS of residential and commercial foam trim, but that’s not all we do. We can make any standard or custom shape out of a variety of materials. 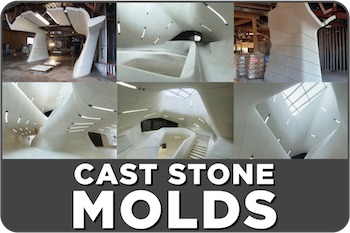 We design and manufacture molds for precast stone, precast concrete, lightweight stone, fiberglass, rubber, and so much more. Our machinery allows us to be extremely precise. 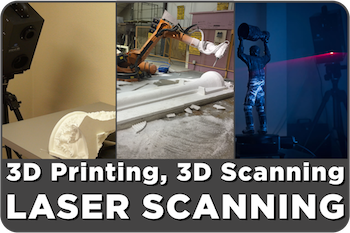 We do 3D scanning, 3D printing and laser scanning. 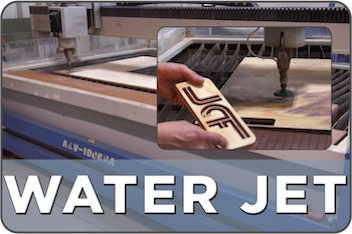 We have a 3 axis water jet that will cut rubber, paper, plastic, wood, fiberglass, and metal up to 2″ thick! We make stage props, statues, and sculptures in 3D. Lots of them. Any size. We machine them, plastic coat them, and get them ready for either end use or a mold. We are fast, efficient, and affordable. We are experienced in large art projects with museums and set pieces. We have a full fab shop that allows us to build any kind of steel structure in house. We can then wrap that in foam and have it delivered and assembled at your location. We don’t waste anything at Johnson County Foam. We recycle it all. We love our planet and want to leave it better than we found it. This also helps keep your costs down. We would love to have the opportunity to serve you on your next project. We have a real passion for this. You won’t be disappointed. Call today to talk to us about how we can help you exceed all your client’s expectations. Stay connected with us on your favorite social media sites. 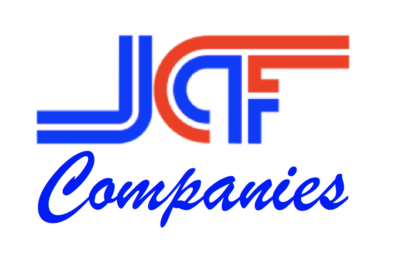 © 2019 JCF Companies. All Rights Reserved.